Members are invited to send in any articles about fishing trips/holidays or venues that they have enjoyed. Information about fishing venues can be of help and interest to other members so it doesn’t matter whether it is somewhere local or across the other side of the world, share it. Any photographs add to the enjoyment and are welcome. Peter Thomas picks out some useful tips from Steve Cullen on improving hook ups. 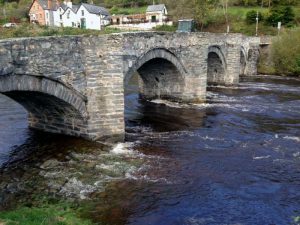 A Club trip to the River Dee at Llangollen. Following the deaths of two very well respected Invicta members Bob Ayres has written tributes which can be viewed by clicking on the links below. Our Northern Invicta Representative Peter Oldham experiences catching beautiful wild browns on the equally beautiful River Tees. Experienced river angler Martyn Sharp on his first experience at fishing for rainbows on a reservoir. Significant that one of his first questions after an hour or so was “How much is a boat seat”! David Moore recalls a memorable day in the 2017 Bob Church Classic on Rutland Water when he was drawn with World Loch-style champion Ian Barr and learnt some valuable lessons. 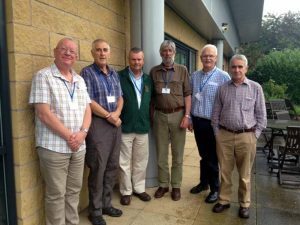 Several anglers from our region made the trip across to Wrexham for the Grayling Society Symposium on Saturday 21st October. 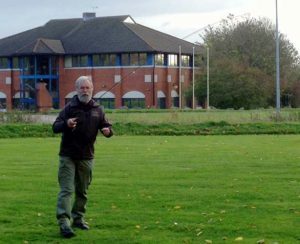 It also gave us the opportunity to meet up with Invicta member Peter Oldham who moved to Cheshire last year. We had booked in for the whole weekend in the hope of some decent fishing on the river Dee on the Sunday; this had been arranged by the society and we were told about our beats and supplied with maps. The symposium had some good speakers and in particular Dave Southall gave an excellent (and impressive) demonstration of Italian style casting and Tenkara. He was casting very light lines 1, 2 and 3 weight into a strong breeze and still getting distance and accuracy. For the ‘centre pin’ enthusiasts Alan Roe gave a tutorial on using the ‘Wallis cast’, a method of casting at distance with a centre pin reel. Very impressive and he made it look much easier than I’m sure it is. It needs practice and requires the skill of getting your timing correct with different hands doing different things – much like the skill required for the double haul. Sadly, during the afternoon ‘Storm David’ made its way across Wales and hourly river reports were showing a rapid rise in levels and wind speed. By Sunday morning we were advised not to attempt fishing as it was up by 1.06m which was a big disappointment, however some of us decided to familiarise ourselves with some of the beats and see what we were missing. One of the chaps from our area Martyn Sharp from Peterborough is a very experienced all round course angler and had taken his trotting gear. He decided it was worth a try and positioned himself near Glyndyfrdwy bridge on the Llangollen to Corwen stretch and took 4 grayling and two brownies. He was probably one of the only people to take a fish from the Dee that day. I told him that he needs widen his angling to include the fly rod and plans a day Grafham before too long. He was very interested in the fly casting clinic that Invicta are planning in the New Year. So, a very enjoyable weekend in good company (at times we got a bit thirsty and had to do something about it) and next year it will be held in the North East. numerous underground waterways and aquifers together with run-off from the hills. Click link to read article: No 5lb Rainbows here! Invicta member John Reynolds has been fishing using the Tenkara method for three or four seasons and shows that he has perfected his this style of fly fishing by being rewarded with a fine wild brownie. 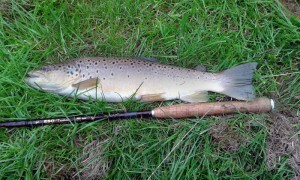 The fish was taken on a ‘daddy’ just a short distance from the Cambridge city centre. 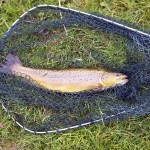 single upstream dry fly or nymph, barbless or debarbed hooks maximum size 12. 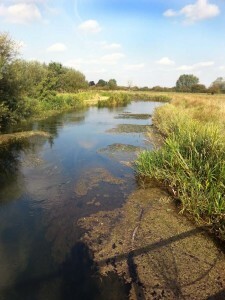 The Yorkshire chalkstream has brown trout, grayling and the occasional rainbow (you are asked to remove any rainbows caught). There is B&B accommodation at the farmhouse for a price. The river is delightful and you may see kingfishers, otters and water voles if you are lucky, Canada geese and cormorants if you’re not. There is a maximum of four rods per day and this time of year a day rod costs £60.00 (range £50 to £70 depending on season). Winter Grayling fishing from 1st October costs from £20 to £30. I had two nice brownies on a day which was torrential rain when they left Lincoln but sunny by lunchtime.